Looking beyond modern science, there’s plenty of evidence to support the notion that human civilizations have been on Earth for many millions of years and have gone through major cycles of collapse and comeback… the so-called End Time scenario. Today we’re at the sunset of the Second Epoch, which began in Babylon. Since that ancient time, humans have been a frustrated species… pulled by opposing forces in a noble-savage world. Our noble side loves humanity and life on Earth. and wants to make sure everyone and everything are taken care of in a peaceful, productive, progressing (i.e. noble) world. Our savage side fears the ruthless edge of human nature, and wants to make sure we and those whom we love survive amid the dangers of a hostile, militant, divisive (i.e.savage) world. As a result, our societies, like we ourselves, have always been pulled in two directions by the noble-savage forces within… hawks vs doves… conservatives vs liberals… capitalists vs communists… military programs vs social programs…. Ultimately, the noble side of humanity will prevail, simply because it represents the finer spirit within us. Humanity’s noble side is the eternal part of us that will someday fulfill our mission on Earth: to restore paradise. Our personal noble side is the part of us that resonates with our spiritual core… the part of us that compels us to be kind and will transport us to paradise after we die. Meanwhile, humanity moves endlessly through noble times and savage times in cycles that have grown in intensity through the ages… especially over the past few centuries. Sources: War deaths (red line) adapted from David Christian, Maps of Time: An Introduction to Big History (Berkeley: University of California Press 2004), 458, and published online here…. 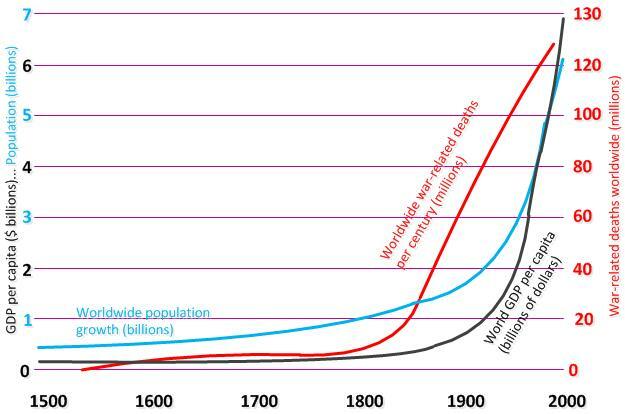 Population and GDP growth (blue and black lines) adapted from the National Review and published here…. Conditions on Earth today are destabilizing quickly when you consider geography, morality, politics and, I’m sure, various other gauges… which taken together suggest that we are approaching an End Time. 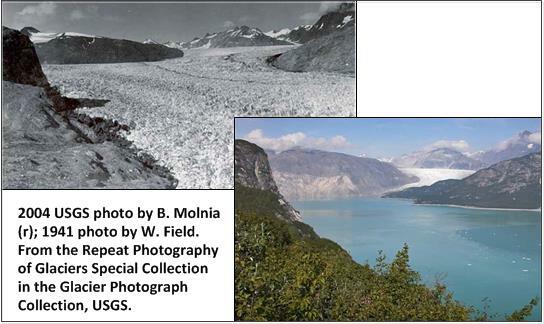 The melting of the Muir Glacier in Alaska attests to the current instability of the planet. As the earth warms… ice caps and glaciers melt, the sea level rises, and coastal areas get submerged. A sea level rise of 12 feet (3-4 meters) is likely to happen next century, if predictions hold course for a rise of up to 7 feet this century. 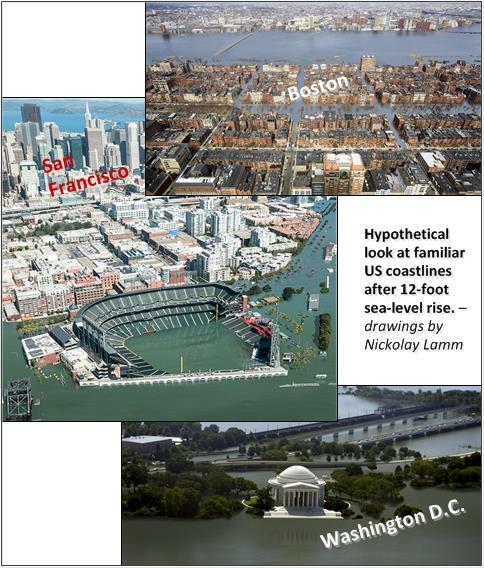 This is what various coastal geographies here in the States might look like after a 12-foot sea-level rise. 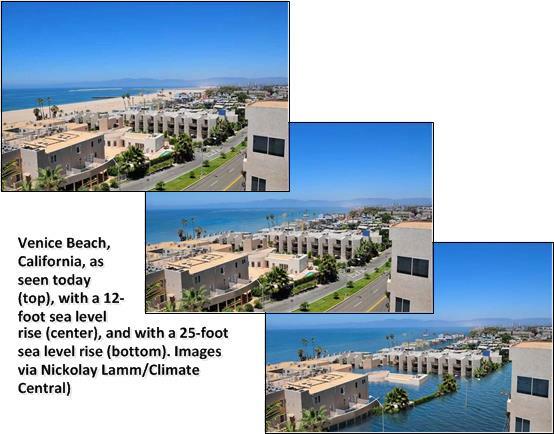 And this is how the popular Venice Beach could evolve…. Sea levels could rise as much as 69 feet by the time global warming has played itself out. So it would seem that earth changes often associated with the End Time are already underway. Producers of movies, TV shows, and video games have found a winning formula for success: Focus on violence to hook viewers. The savage side of human nature is driven largely by adrenaline, testosterone, and other hormones associated with violence and fear, hence the morbid attraction of most people to horror films, action movies, and graphic video games. 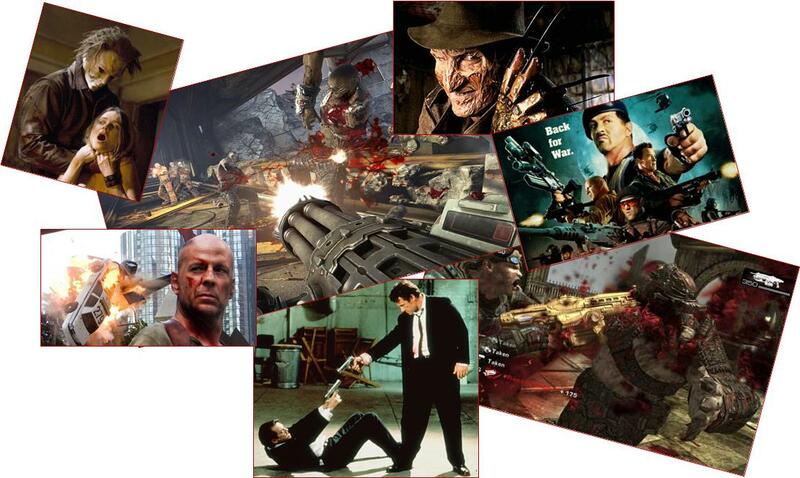 As producers race to make money and boost ratings, violence spreads through movies, TV, Internet, and video game consoles into homes and communities everywhere. Never has violence been so widespread and so pervasive in people’s minds as it is today. … another indication that the world is destabilizing quickly. Politics is probably the ultimate manifestation of our noble-savage nature as human beings, especially during the past hundred years. On the noble side, the world has been integrated with transportation and communication networks, lighted and powered by vast energy supplies, populated by bustling cities and magnificent architecture. Today a quarter of the people on Earth have smartphones… small devices they carry around that link them to the global brain… the Internet. On the savage side, we’ve killed some 200 million of our fellow humans in war-related violence. We’ve stockpiled enough atomic weapons to destroy life on Earth several times over. Serial murder, drug addiction, sexual abuse, organized crime, famine, and poverty have reached epidemic proportions. The past century has been an especially brutal and savage time in politics, from the two World Wars to the many regional conflicts going on constantly… especially those involving Africa, the Middle East, and the USA. One way to get a good glimpse of the savagery is by watching Oliver Stone’s Untold History of the United States, especially episodes 3 and 4, which cover World War II and the ensuing “Cold War” between the Americans and the Soviets… the US and USSR… capitalism vs communism… a period in which humanity trembled under the threat of nuclear annihilation. In the closing years of World War II, when the world was in shambles, President Franklin Roosevelt wanted to be succeeded by his vice president, Henry Wallace, a man of peace. Instead, the president was badgered by militant forces in US government and industry to replace Wallace with Harry Truman, a shallow man who would easily be molded into a militant leader. But savagery prevailed under President Truman, who dropped atomic bombs on Japan under the pretense of putting an end to World War II, and then fanned the fear of Soviet communism into the Cold War… and America became rigidly capitalistic, viewing Russia and communism not as able competitors but as dreaded enemies. In the view of Oliver Stone, which I share, Soviet leader Mikhail Gorbachev was a latter-day version of Henry Wallace. Gorbachev almost single-handedly put an end to the Cold War and the nuclear threat that had the world gripped in fear into the 1980s. He dismantled the Soviet arsenal, freed the Soviet Bloc countries in Eastern Europe, and tore down the Berlin Wall. The US, instead of reciprocating with a peaceful gesture, took the course of a military empire. The military and covert organizations became tools of big industry, overpowering smaller nations and ravaging their resources to fuel the machinery of American progress. As we approach the End Time, the most important healing of America will have to involve the break-up of the military-industrial complex (MIC). The end of modern civilization is an inevitable part of the natural cycle of collapse and comeback. Whether it happens in this century or several hundred years from now, it will be a much smoother transition if we can begin getting our affairs in order… if we can bring our noble side to the fore… especially here in the States. This entry was posted in Our ancient heritage, Our paradise destiny, Politics and Economics, Science and Technology, Society and ethics, Worldly matters and tagged climate change, destabilization of planet, End Time, violence in movies, violent video games. Bookmark the permalink.